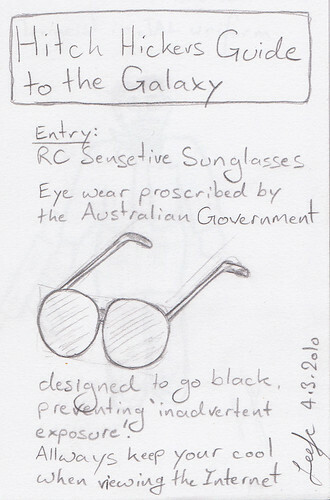 Description: Eye wear proscribed by the Australian Government, designed to go black, preventing ‘inadvertent exposure’. Always keep your cool when viewing the Internet. This entry was posted in Social, Tech and tagged Australia, HHGG, nocleanfeed, Open Internet, sunglasses. Bookmark the permalink.